Keurkloof is south of Oudtshoorn . Oudthoorn lies in the heart of the picturesque Little Karoo, one of the hottest places during the South African summer. 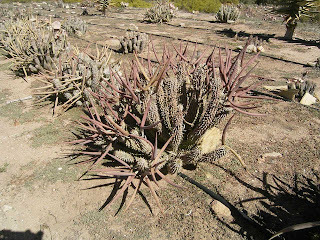 This is only one of the areas where we cultivate Hoodia gordonii. 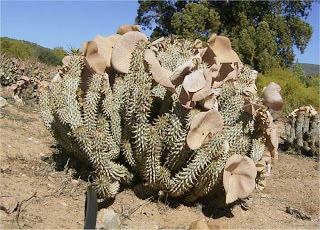 Hoodia gordonii under drip irrigation at Keurkloof. Cultivation is done as naturally as possible. The drips are only used during the early stages of growth. After about 3 years the plants have to survive on natural rainfall. 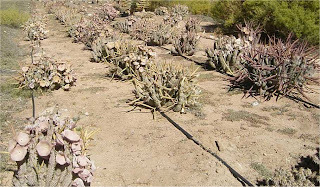 Cultivated plants are very prone to die when overwatered. Most plants here are over 5 years of age. 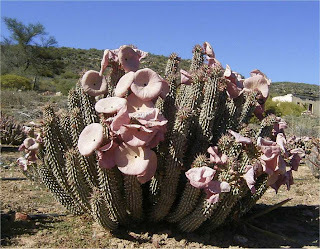 An adult plant of Hoodia gordonii. Plants this size have to survive on natural rainfall. Plants flower profusely numerous times during the hot months. No artificial fertilizer is added and no pecticides are used. Weeding is a constant task. An adult plant full of seedpods. Some plants are making seed while others are still flowering.